Meet 52 icons of colour from the past and present in this celebration of inspirational achievement - a collection of stories about changemakers to encourage, inspire and empower the next generation. Jamia Wilson has carefully curated this range of black icons and the book is stylishly brought together by Andrea Pippins' colorful and celebratory illustrations. 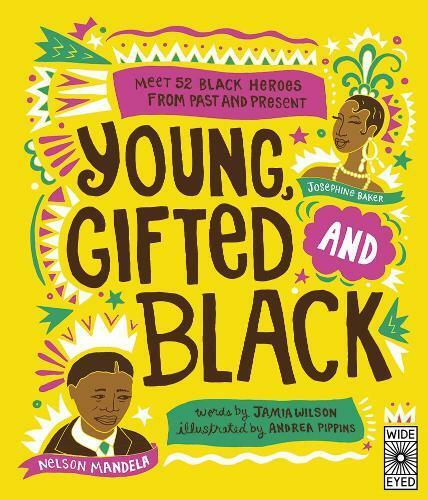 Written in the spirit of Nina Simone’s song ‘To Be Young, Gifted, and Black,’ this vibrant book is a perfect introduction to both historic and present-day icons and heroes. Meet figureheads, leaders and pioneers such as Martin Luther King Jr., Nelson Mandela and Rosa Parks, as well as cultural trailblazers and athletes like Stevie Wonder, Oprah Winfrey and Serena Williams. All children deserve to see themselves represented positively in the books they read. Highlighting the talent and contributions of black leaders and changemakers from around the world, readers of all backgrounds will be empowered to discover what they too can achieve. Strong, courageous, talented and diverse, these extraordinary men and women’s achievements will inspire a new generation to chase their dream… whatever it may be.